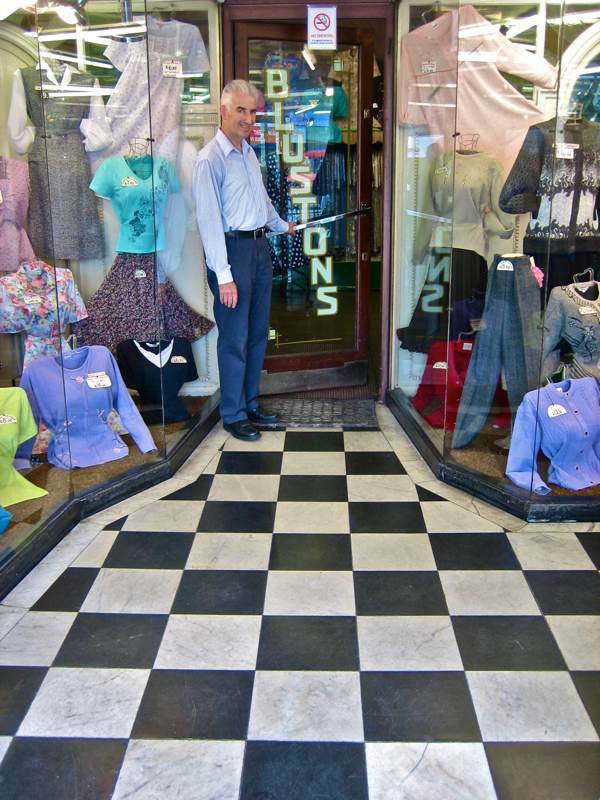 If you are considering a new gown for Autumn, then you might like to take a hop, skip and a jump over to Blustons in Kentish Town, where Michael Albert will be waiting eagerly to welcome you to the family business founded by his grandparents Samuel & Jane Bluston. 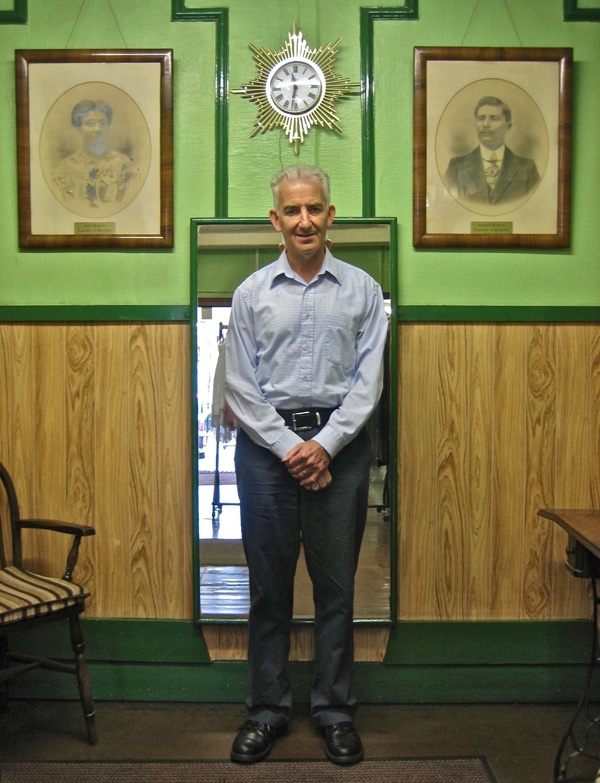 Pictured here in the changing room at the rear of his immaculately preserved eau-de-nil store – standing between portraits of the progenitors of this legend in ladies’ clothing – Michael is the proud custodian of the shrine to the Blustons, whose romance blossomed over sewing machines in an East End clothing factory a century ago. 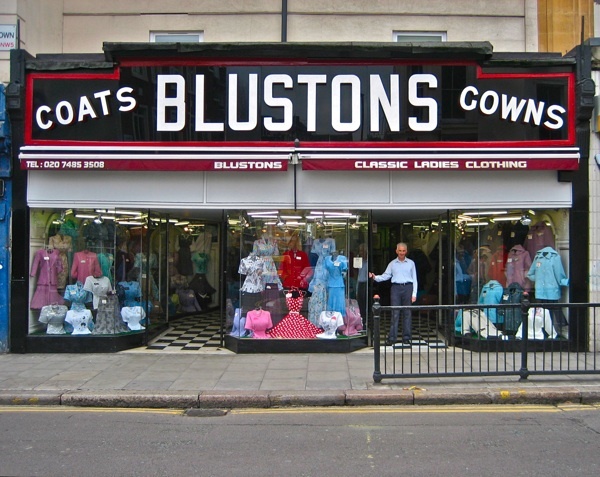 Outside, upon the art deco facade, the heroic name of Blustons is proclaimed to the world in three-dimensional block capitals, flanked by the words “coats” and “gowns,” paying court like flunkeys. A marble checkboarded entrance leads you between gleaming windows filled with a magnificent array of clothing, some on mannequins and some suspended upon lines as if floating like kites on the breeze. You seize the chrome handle and pull, and you are transported into a Shangri-La of green paint and old lino, where the dress styles have remained eternally unchanged. In the fickle and capricious world of fashion, this is the strange magic of Blustons. Michael Albert and his colleague Barbara Smith run the shop with the effortless aplomb of a vaudeville conjurer and his assistant. You select your desired gown, Barbara lifts it from the rails with a flourish, sweeps aside the curtain of the cubicle with practised ease, and invites you to step inside. Yet, even though I was a perverse customer who had come not to seek a gown but to discover the story of Blustons, Michael was gracious enough to indulge my fancy. “My grandparents started the store in the nineteen twenties, they had four shops including one on Oxford St and they had four daughters – Minnie, Sophie, Anne and Esther – who were each given a shop to look after, but two weren’t interested, so my mother and her sister had to run them all. My grandparents were originally sent here from Russia by their parents towards the end of the nineteenth century to get away from the White Russians – Jewish people were restricted in what they could do, banking and commerce were closed to them, so really the only trade open to them was tailoring or being seamstresses. They came to live with relatives in the East End and ended up working on sewing machines in the same workshop, one behind the other – that’s how they met – and they got talking. They discovered they shared an uncle, and because they were closely related, they had to get a special dispensation to get married. 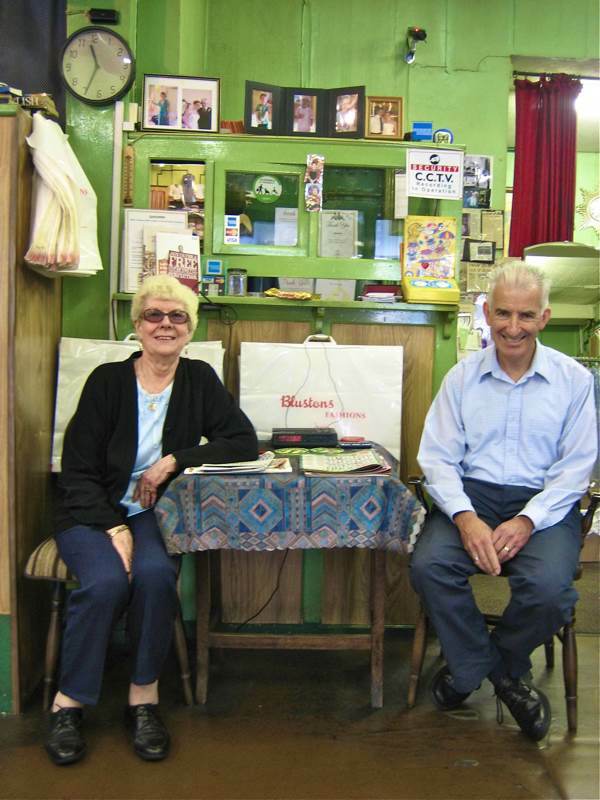 My mother, Minnie, had this shop when she got married and my aunt Sophie ran the shop in Dalston, where they started. My grandfather had a workshop over the shop there and he specialised in tailoring suits for ladies. When I was sixteen, my father had a heart attack and I came here to help my mother while my father was in hospital. I never intended to go into the shop, yet when my father eventually came back, I stayed on and I have been here ever since. It gives me great satisfaction, going out buying goods, displaying them and selling them. I do the entire window display every season, perhaps four times a year. I don’t do it quite as often as I did, I’m getting lazy. It hasn’t really changed the whole time I have been here. When I started, we sold a lot of bridal gowns and mourning wear. Nowadays we do a lot of separates, blouses and skirts, and twenty years ago we didn’t sell any trousers, whereas now we sell more trousers than skirts. Over time, the age group of our customers has gone up and up. On average, our customers are eighty to one hundred years old. We have people who buy clothes here for for their mothers who are 104 and 105, in two cases. A lot of our older customers moved out to live in new towns such as Basildon and Basingstoke, but they come in when they visit relatives nearby. One woman came from Australia to see us. And then, to illustrate the cyclical nature of fashion, Michael produced the current edition of Vogue, leafing through with pride to reveal a photo of a model standing in the entrance of Blustons in a Dior suit, not so different from those on sale. Both he and Barbara exchanged smiles, glowing with pleasure at such an authoritative confirmation of their shared belief that the clothing they sell transcends mere trend. And as I knew my story would not be complete without a word from Barbara, I took this opportunity to ask how she came to be there. Something becomes classic when it cannot be improved upon and this is the nature of Blustons’ dress shop. 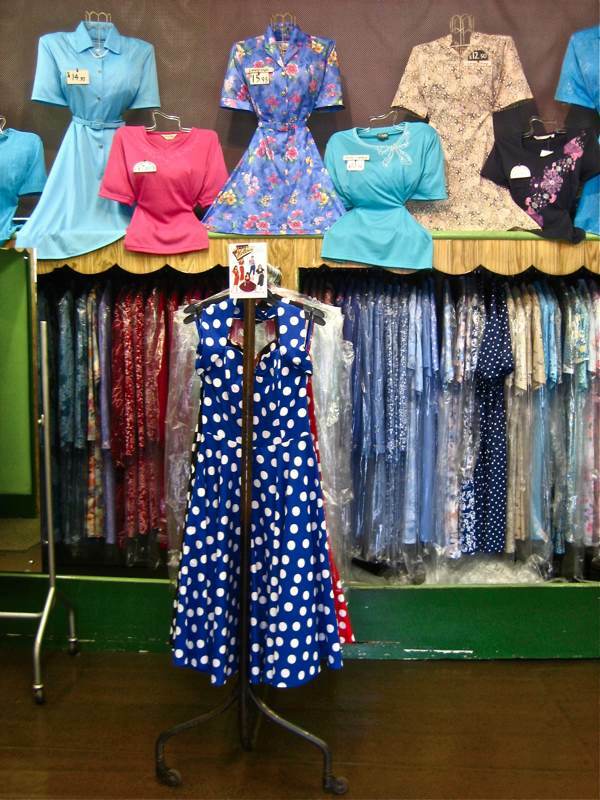 Even though most of the customers are octogenarians and their seniors, the renewed appeal of this clothing for the younger generation is now bringing a whole new clientele. So, as there is no reason to suppose that this cycle should not repeat in perpetuity, I hope Blustons will go on forever – the eternal Blustons of Kentish Town. Barbara Smith & Michael Albert welcome you to Blustons. 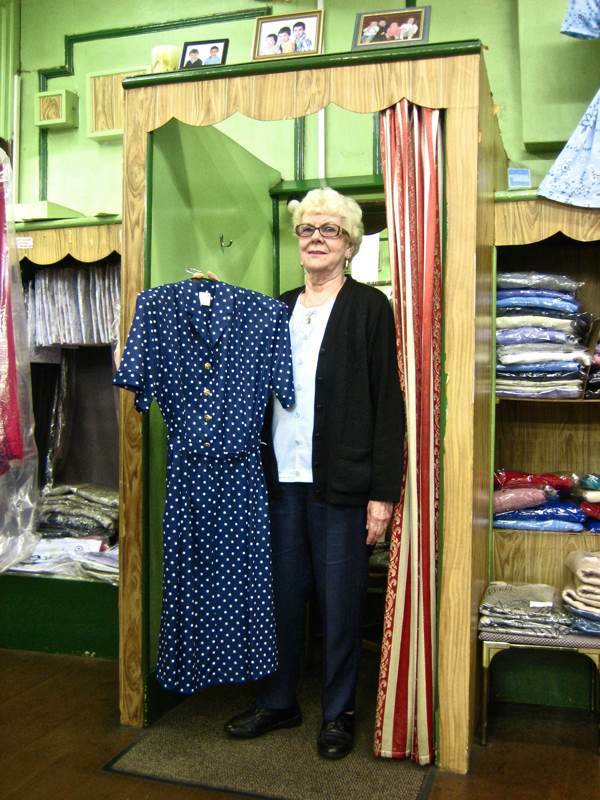 Barbara Smith with one of Blustons’ classic dresses. love to barbara and the boss who let her bring her daughter to work. the polka dot sundress is to die for. tell them. As always, a lovely chunk of nostalgia. Just a thought that perhaps someone from Blustons could answer ? Pre-war, most clothing shops of this type and certainly those in Crisp St., Poplar, used to employ a “Shlepper” to stand outside the shop and “shlepp” the customers inside if they were just looking in the window and trying to make up their mind. Did Blustons ever do this ? We did not have a shlepper. My dad (Harry) used to do it in his time at the shop. We know that lots of other shops did. Have just walked down a bit of Brick Lane after an emergency dash to get a present (Rough Trade), some watercolour paper (Atlantis) and 3 dozen plain beigels. Can’t help but think of all those proprietors of curry houses trying to generate trade as modern day ‘shleppers’. Thanks for the prompt comments. I wish they sold online! If the shirtwaist dresses are cotton, I and my friends would buy them up! I wear a US 18 petite, and the “plus size clothes” here in the US fit like garbage, wear out fast, and are made of cheap poly. And not half as cute as those, even the “frumpy Queen” dresses! Funny that the store and its customers are about the same age! 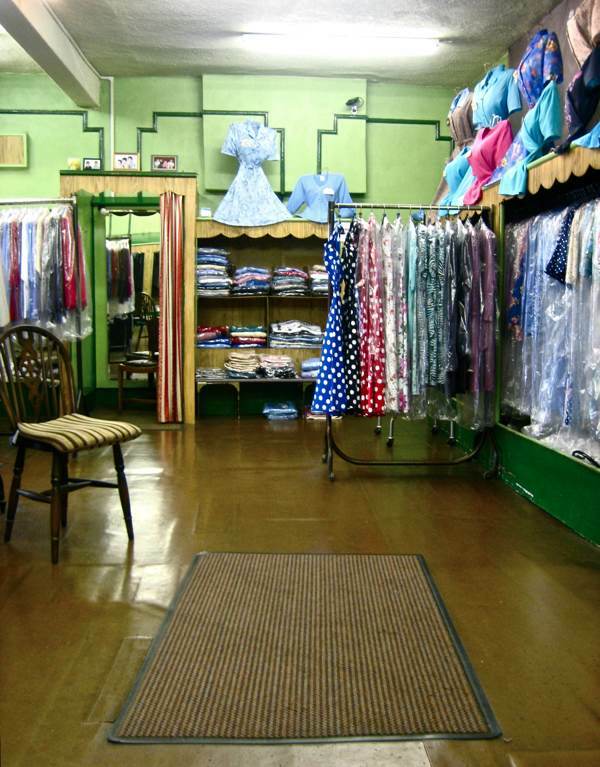 We LOVE this store….want to start a facebook group for it!!!!! !